Podcast Summary:Telling your story in a compelling, heart-felt way is the first step toward connecting with your next new client. People trust people with similar backgrounds and experiences. 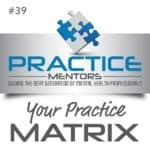 Podcast Summary: Attorney Steve Frankel discuss California’s complaint process, over regulation of the mental health industry and its impact on mental health providers. Podcast Summary: Kate Erickson, a business and marketing force to be reckoned with, speaks to Kathleen about the importance of planning your practice, before you begin. Podcast Summary: Does PCI apply to me? If you’re a licensed health professional and you can fog a mirror, it applies. You’ll need a PCI Security Risk Assessment, so start by listening to what Tod Ferran and Kathleen Mills have to say.